Of all the sustainability indicators, climate change is arguably the most urgent, not just in terms of impact, but also complexity. It is also the one that raises the greatest degree of uncertainty, which is why, for many investors, climate change is their No. 1 ESG concern. Their concerns are echoed in this year's edition of the World Economic Forum's Global Risks Report, which reveals that for the third consecutive year environmental risks dominate the list — both in terms of impact and likelihood. One of the key drivers underpinning those concerns is regulation. Today, there are more than 1,500 separate pieces of climate policy or legislation in force around the world. Some impact the companies that investors are invested in while others target the investors themselves. In France, for example, climate change reporting became mandatory for institutional investors in 2015. The reasons for this raft of regulation were made extremely clear in last year's report from the Intergovernmental Panel on Climate Change. It pointed to the urgent action needed to limit global warming to 1.5 degrees Celsius before 2030 if we are to avoid irreversible and far-reaching damage to the world we live in. So how do investors deal with the myriad challenges thrown up by climate change? How can they navigate the complex web of legislation while also understanding and synthesizing the effects and consequences of differing climate change scenarios? How could different sectors be affected by climate change? Clearly, there are no simple answers, but let's look briefly at an approach that offers investors a way to start thinking about climate change and identify not just risks, but also opportunities. Most investors are familiar with scenario analysis, but its application to climate change is relatively recent. 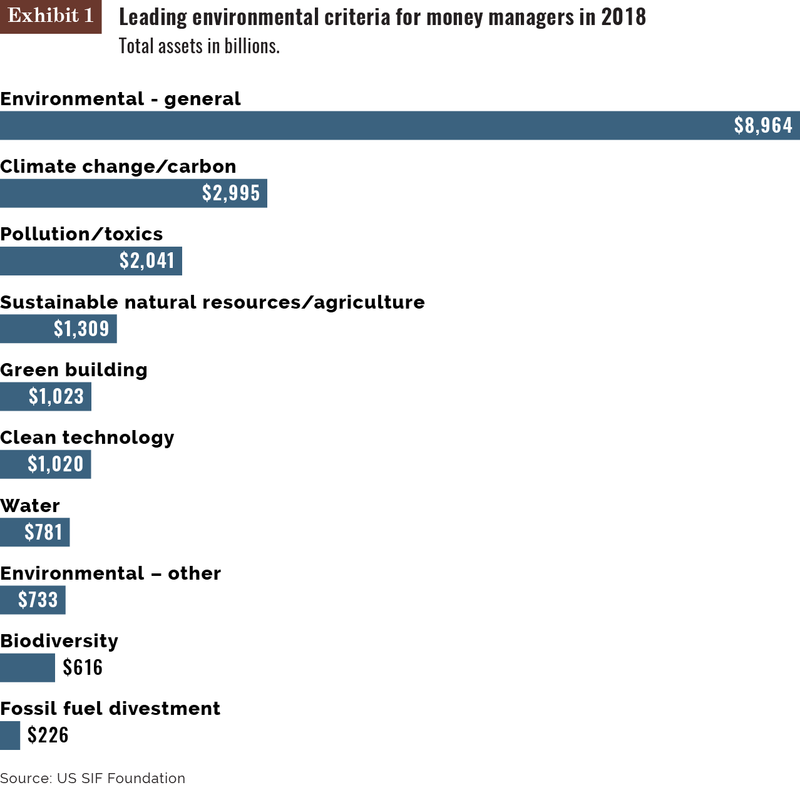 Nonetheless, it formed one of the key recommendations to come out of the Task Force on Climate-related Financial Disclosures in 2017, led by Michael Bloomberg and supported by Mark Carney, governor of the Bank of England. They explicitly stated that investors and companies should be asked to undertake climate change scenario analysis. The Institutional Investors Group on Climate Change formed a working group to create a five-step framework to help asset owners and managers use scenario analysis as a means of understanding how climate change can drive financial impact across their portfolios. A key element this initiative identified was the need to take a cross-functional approach, bringing together experts with backgrounds in risk management, investment and ESG to create outcomes which are actionable and investment-relevant. Ultimately though, by giving investors a structured way to think about climate change, what an effective climate change scenario analysis can offer is a starting point from which the early warning signs can be monitored. 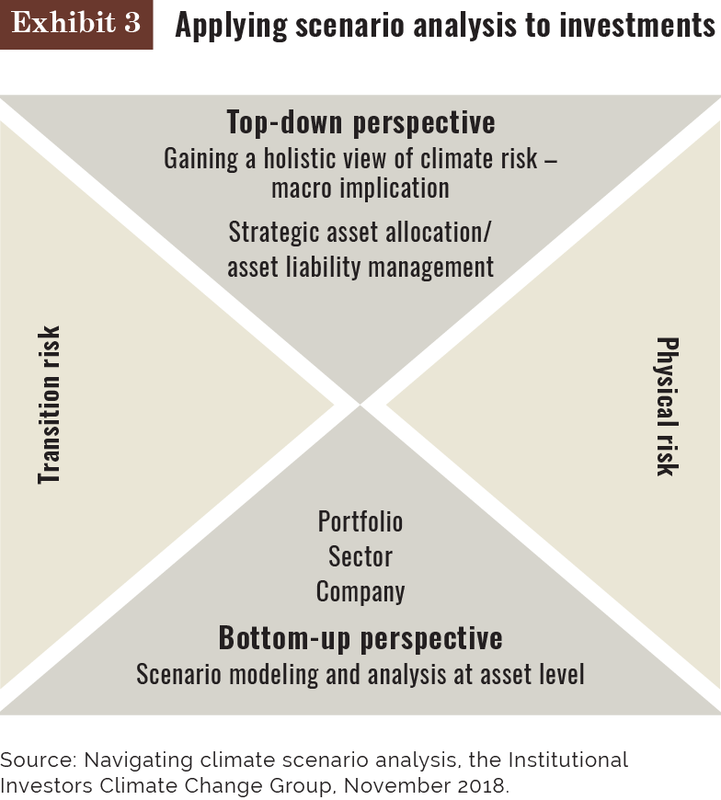 By observing these, investors are better placed to assess which climate scenario is most likely to unfold and position their investment strategy accordingly. In this way, they can optimize emerging opportunities while better managing downside risk. So how could scenario analysis work in practice at a portfolio level? Investors can consider a forward-looking, rules-based approach using a probabilistic framework to capture the inherent uncertainty surrounding carbon data. A key building block of such a strategy is the alignment of investments with a 2 degrees Celsius scenario. 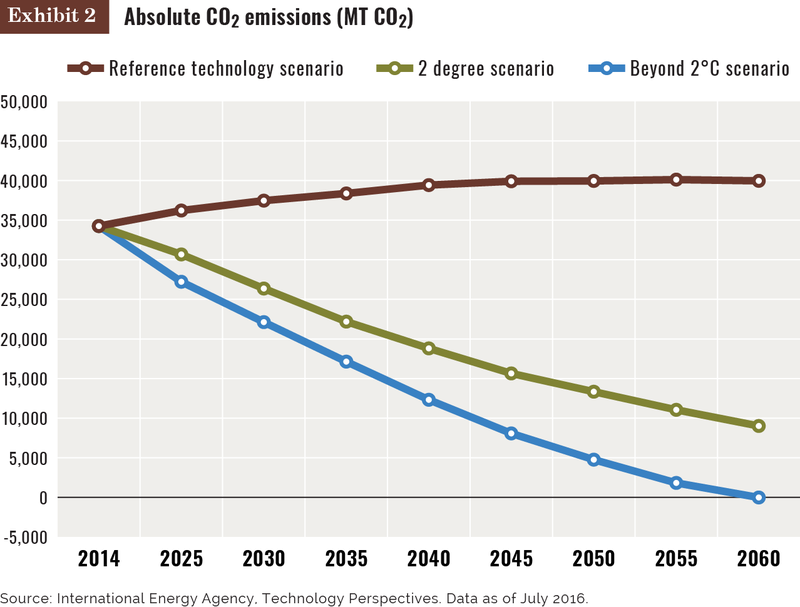 A quantitative model compares the company's carbon footprint trend with the emission reduction required by the International Energy Agency's 2 degrees Celsius scenario. An estimate of "glidepath probability" shows how close the company is to the necessary trajectory. In our view, a quantitative model works best when it is combined with a range of other quantitative and qualitative information, including companies' climate disclosures, policies, objectives and/or initiatives related to carbon efficiency; carbon footprint; renewable energy generation and technologies; and power generation from coal and companies owning coal, oil and gas reserves. Information, including the glidepath probability, can also help identify companies that are a priority for engagement. When thinking about climate change in an investment context, engagement is an important element for investors as it offers an opportunity to directly influence company behavior. As part of a voting and engagement program, investors would benefit by seeking an improvement in companies' governance, risk management, strategic alignment, targets and metrics, as well as the overall approach to disclosure. Whenever possible, we align our engagements with collaborative programs that are consistent with our goals. This includes Climate Action 100 Plus — a global initiative of more than 300 investors with more than $30 trillion of assets under management. In addition, we align our engagements on climate issues with our voting policy so that we support climate resolutions that are consistent with long-term shareholder interests. These engagements have highlighted several findings. For example, many oil and gas companies are still in the early stages of explaining strategy implications, with just a few being able to articulate future actions in terms of business models. In the utilities sector, particularly in the U.S., a large number of companies are retiring coal-fired power stations. Some are being replaced with natural gas, while others have more ambitious plans for renewable energy. Clearly, climate change is one of the most pressing concerns that investors currently face. And for investee companies, climate transition is a material consideration. Nonetheless, there are means by which investors, even those who are new to investing for climate change, can approach the topic and strategies already exist that allow them to manage their exposure to climate change within their chosen risk-return profile. Finally, both asset managers and asset owners have the capability to drive positive long-term change by engaging with companies to influence their business models and activities as they impact on climate transition. Michael Baldinger is New York-based head of sustainable and impact investing and Francis Condon is an Amsterdam-based sustainable and impact investing research analyst at UBS Asset Management. This content represents the views of the authors. It was submitted and edited under P&I guidelines but is not a product of P&I's editorial team.